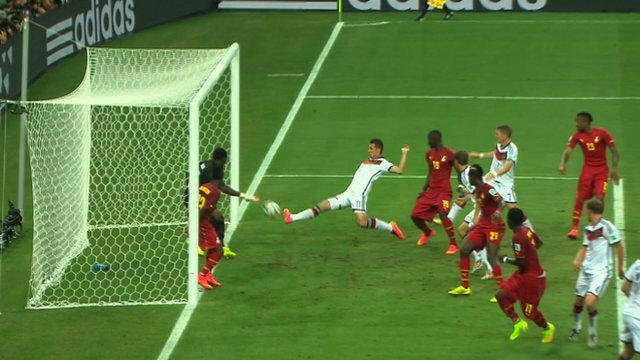 The humble 36-year-old Germany striker Klose etched his Polish name into immortality on Saturday when he scored his 15th World Cup goal in the match against Ghana. But on Saturday the sommersault was back after he scored the equaliser from close range with his first touch less than two minutes after coming off the bench in a 2-2 draw in Group G.
"I don't know how long its been since I did a sommersault. but at least it worked out," he said after the match. "You come in and want to turn the game around. Twenty (World Cup) matches and 15 goals isn't bad at all." The best German striker of his generation, Klose is also his country's all-time leading scorer with 70 goals in 133 games. In fact, Klose is the only specialised striker in Germany coach Joachim Loew's squad in Brazil after Gomez was dropped. Nokia Achieves Record 4G Speed Of "3.78 Gbps"
17 yards - the longest headed goal "measured at a World Cup" since 1970.